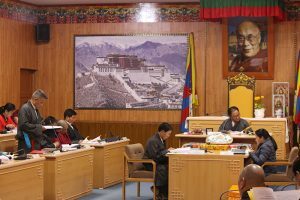 Dharamsala: The Seventh Session of the 16th Tibetan Parliament-in-Exile which is from March 19 to March 29 commenced with the Speaker’s session commencement announcement at 9:30 am today. 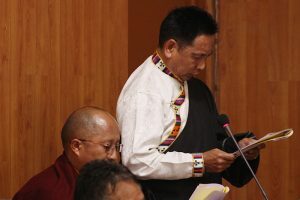 The session continued with the singing of the Tibetan national anthem in the parliamentary hall, assembled with the Speaker of the Tibetan Parliament-in-Exile and its Deputy Speaker Acharya Yeshi Phuntsok, Sikyong of the Central Tibetan Administration along with his ministerial colleagues as well as the parliamentarians. 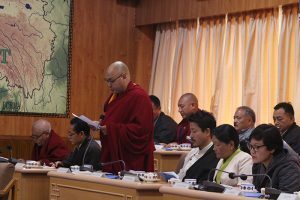 It was followed by the Speaker Mr. Pema Jungney’s session-opening speech and the appointment of Acting Speaker and Ad Hoc committee members. 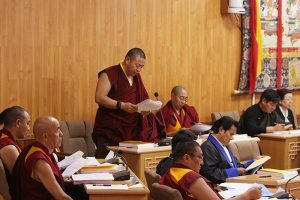 In the opening speech, the speaker highlighted the important actions completed in the past six months after the conclusion of 6th session of the 16th Tibetan Parliament-in-Exile (TPiE). 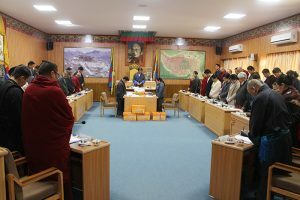 Starting from Swearing-in Ceremony of the Speaker on 1 December, 2019, the Long Life Offering to His Holiness the 14th Dalai Lama at Bodh Gaya, Visitation of Parliamentarians to Tibetan Settlements/communities, the successful conclusion of 2018 Tibet Lobby Campaign of TPiE in various states of India, Tibet Advocacy programme of Parliamentarians to Denmark, Norway, England & Scotland and the interactions of Tibetan Parliamentarians with Members of Himachal Pradesh Vihdan Sabha & Parliament from Rajya Sabha and Lok Sabha by hosting high tea and dinner reception. 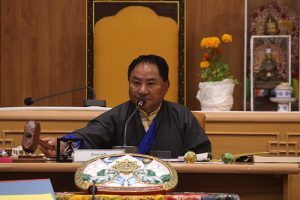 Similarly, Speaker with profound gratitude, emphasized about the visit of many Parliamentary delegations from various countries to Tibetan Parliamentary Secretariat for extending their solidarity and support for the just cause of Tibet. And further extended his gratitude to the US President and US Congress for supporting and making the Reciprocal Access to Tibet Act into law. 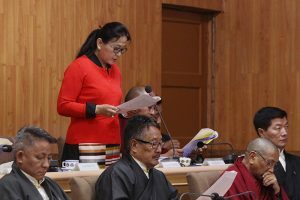 Besides that, Speaker appealed the members to engage in a constructive and sensible discussion bearing in mind the aspiration of all Tibetans since the members are elected by the people with great hope. 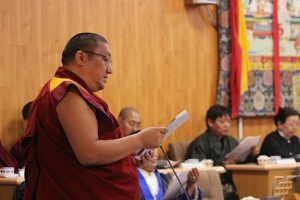 He urged the members to use this platform to serve for the greater cause of Tibetan issue and reminded them that every actions of them will reflect the views and sentiments of the Tibetan people and the world as well. 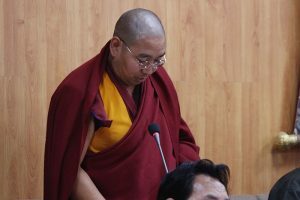 At the end of inaugural speech, Speaker offered and prayed for the Long Life of His Holiness the 14th Dalai Lama and the successful closing of this session. Thereafter, the list of business marking the official obituary reference proceeded with Parliamentarian Ven. Khenpo Sonam Tenphel paying tribute to Kathok Getse Rinpoche, 7th head of Nyingma tradition who passed away on 19 November 2018 in Nepal at the age of 64. 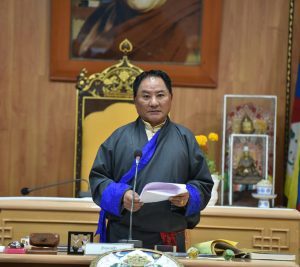 Similarly, Parliamentarian Geshe Monlam Tharchin paid tribute to Dopo, a 23 years youth from Ngaba, Amdo who sacrificed himself by self-immolating on 4 November 2018. Official obituary reference to the passing away of former Speaker Gyari Lodoe Gyaltsen who passed away on 29 October 2018 at the age of 70 was paid by Geshe Lharampa Atuk Tsetan followed by obituary to former U-Tsang Parliamentarian Toe Ngari Shunpa Kyunglo Dhakpa Namgyal was paid by Mrs. Juchen Konchok Choedon, obituary to late Hon. George Fernandes, the former defense minister, and a staunch Tibet supporter was made by Parliamentarian Tsanetsang Dhondup Tashi, while Parliamentarian Mr. Karma Gelek paid tribute to Hon. George H.W. Bush, former President of the U.S.A. The house observed a minute of silence to mourn for the official obituary references. 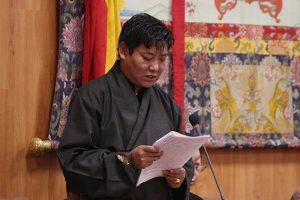 Parliamentarian Mr. Ngawang Tharpa Gewatsang presented the Official Solidarity Motion on the critical situations inside Tibet, which was supported by Parliamentarian Ven. Khenpo Kada Ngedhup Sonam. The motion was tabled for debate and discussion. The morning session thus got adjourned for lunch break at 12:30 and resumed at 1:30 pm. The afternoon session started with Finance Minister of Central Tibetan Administration, Mr. 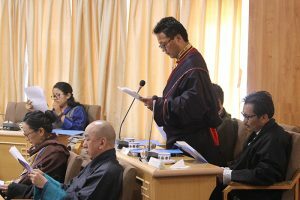 Karma Yeshi laying before the 2019-2020 Budget of Central Tibetan Administration, which was subsequently followed by Parliamentarian Geshe Monlam Tharchin, reading out the Précis report prepared by the Budget Estimate Committee of the Tibetan Parliament-in-Exile. 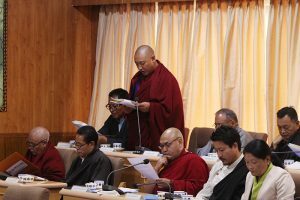 The motion for debate on the Central Tibetan Administration’s 2019-2020 Budget was raised by Parliamentarian Ven. Tenpa Yarphel and supported by Parliamentarian Ven. Khenpo Sonam Tenphel.